This is a 6 part video tutorial which aims to guide people through the process of creating a weapon model (glock) and compiling it for use by the Half-Life 2 Source Engine. The principles applied here can be used to make a model for any game using 3DSMax. This tutorial is brought to you by the user Stormy from Game-Artist.Net, a community for and by game artists. This set of tutorials is intended to help and guide people through the full process of creating a weapon and compiling it into the Half-Life 2 Source Engine. The tutorials are going to be released in chapters, each of which will focus on a specific area of the pipeline from modeling through texturing and compiling and finally compiling into Counter-Strike: Source. I know that not everyone will need to know every chapter but I very much hope there will be a chapter for everyone, if you know about modeling but not texturing there will be something for you and visa versa. These are the first major video tutorials I have done so any feed back for the next chapter (texturing) will be good to help me produce better quality videos and in turn help the community better. Good luck and I hope to be uploading the next chapter as soon as possible. 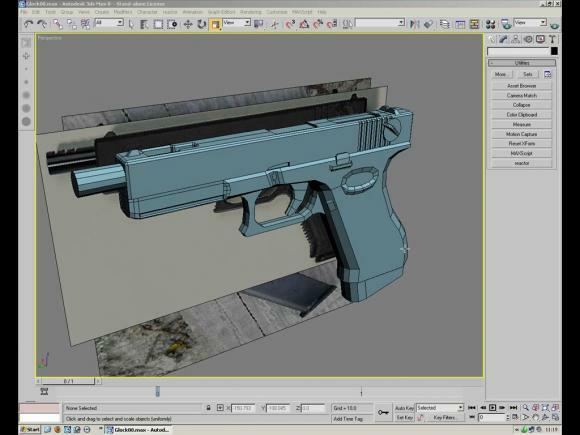 Download the first 6 videos and learn how to model a 3D glock weapon from scratch. Discussion about the video (i.e. techniques, issues, etc.) is encouraged! The second part of this tutorial which covers the skinning and texturing aspect can be found here. You can't unrar this with Winrar nor with 7-zip, something is wrong with it. I will verify the file tonight and fix it if I have any problems. Downloaded it from Filefront this time and they worked perfect. Awsome tutorial! Nice to see the tut's uploaded to a better server then the ones I origanaly posted them on. Good Luck, Skinning tuts soon! Impossible to rate actual thing if I CAN'T BLOODY GET IT - ESPECIALLY IF I've BEEN DOWNLOADING IT FOR LIKE AN HOUR!!! I know you use the Autodesk 3DS MAX 8 but did you buy it or download it cause it is an expensive program i was wondering if i could get it for free from somewhere Do you know where i could without the risk of getting my computer full of spam and spyware? There are many tutorials over the net for this kind of thing but there are few tutorials that show from start to finish. will theses tuts go from start to finish to show ppl how to get a gun textured/animated/coded into a mod? The same for characters and vehicles. I can give you a link! I have seen a lot of tutorials but this is the best one by far. Thank you so much man, it's because of people like you that people like me can also learn how to model!!!! i thought this showed you how to get your weapons in to the game aswell? when i play the video it brings up i tunes, i have run out of ideas. if i play it with media player it has no sound. SOMEONE PLEASE HELP ME!!!! An interesting tip: use VLC media player, this will 99,9% of the time have a suporting codec installed already. Thank you for this Stormy! Im unsure if any one that's a student can sign up for me my engineering teacher showed me it for the autodesk engineering version (also got 3ds max just a few days ago with the website). It's a large file to download so if you got slow internet good luck. its the importing into source anbd the exporting from max that i am interested in, is this explained here, too? This way is easier: Just do a line then extrude it! Is there any other programme used for making guns? This helped me understand modeling a lot more. I am sincerely grateful, as a beginner in game design I appreciate any and all kinds of help & guidance. Any chance on getting a YouTube or other streaming link for these videos?